Down the memory Lane: Sia is a fighter! Today when I watched the episode of Humse Hai Liife, it took me back to my Table Tennis days. Those were the days when I couldn’t sleep beyond 4 AM and hence would be up for a 6 AM pratice. I would start with my regime right from home mentally. The fitness, the shadow practice the actual practise in the court and finally getting geared up for tournaments- all of them came back to me in a flash and turned me emotional all of a sudden! 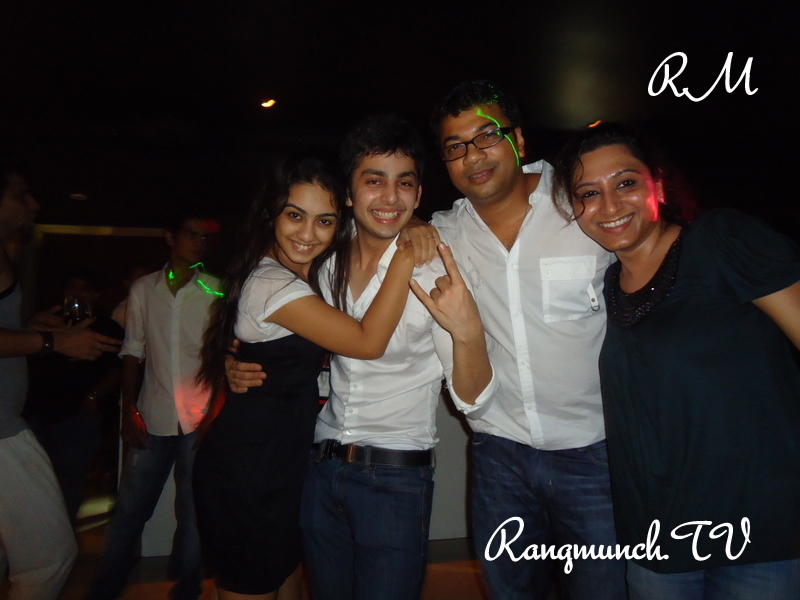 Thats the reason why I chose to share my experience with all of you here on Rangmunch. My coach also, a brutal man taught me never to give up. He would put us through three hours of practice in the morning, and three hours in the evening, make us play with boys, have multi-ball sessions to improve our concentration, stamina as a well as resistance! And after a tired session once we would be back home, our minds would still be working at what next we could do to better ourselves! Now when I think those were indeed the best days of my life! There would be days when we would be dead tired, and Sir would say, you are not bleeding yet, so go on! Back then it sounded so brutal I would make up my mind not to go for the next session, but something inside would automatically pull me back into the sport! No matter how much I would try, nothing else would fill up my mind. Backsides of exam papers would have drawings of a Table-Tennis table, and I would plan strategies as to how I would play. The tension of going for a tournament would make me finish my exam paper one hour in advance. 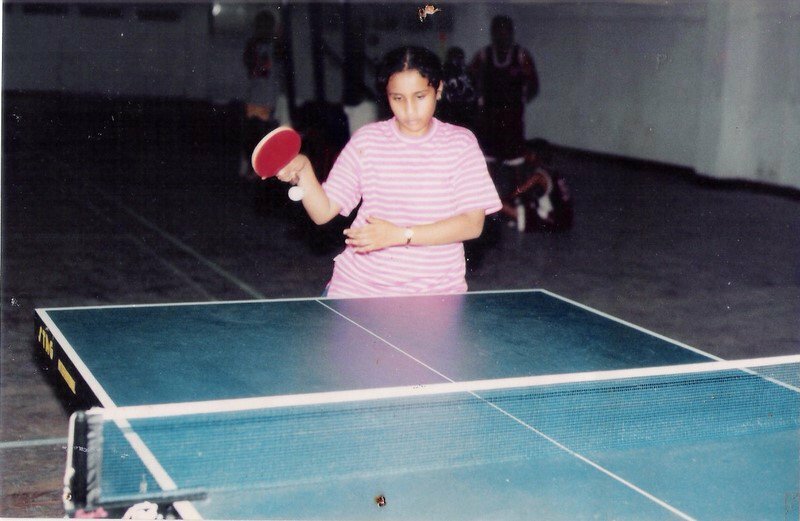 And then came my first tournament, where I was competing for the first time with a set of people I had never faced, gave me jitters. But reaching semi-finals in that very tournament gave me an all new spirit. I never wanted to look back after that. I wanted to win at any cost no matter what. And I did ensure I didn’t rest until I did win the title I was striving towards. Last night Sia made me nostalgic and took me down the memory lane. I was also at one point in time the only girl in my stadium playing with a bunch of boys. It was not until summer camps that we there would be other girls who would come and go. I was in fact treated specially because I was the only girl. I would always get to play on one side while the others would take turns and change. I would be made the group leader once in a while and eventually when the tournaments happened, I would also get to lead! All of that was an experience I will hold dear to my heart always! There were of course other girls, but our coach insisted on us playing with the boys! But the one moment of the day we all looked forward to was the time when we got to play with our Coach as the aim would be to defeat him, since that was the Challenge he had posed in front of all of us. Sia’s never say die spirit makes me relate to her. It makes me want to take up the sport that I gave up for studies again! It makes me feel for her, and it makes me want to watch her learn, practice, grow eventually and win! I cried last night, because I saw this, and smiled at the irony that I never cried when I lost my matches since I always knew I was yet to give my best! The only time I cried was when I lost a winning match and that jolted me never to make the mistake again. This is also one of the reasons why I totally enjoy the sports backed episodes! Sia has a long way to go, and I am sure the way they have sketched her she will make a mark for herself. But I am certainly also looking forward to seeing her sweat it out and yes if it helps keep Raghav out of focus for a while! LOL! Shows such as this, should also encourage young sports persons by motivating them and giving them lessons of never say die! In a hard competitive world today where there is too much pressure on a child, a very motivational approach to sports and other activity would surely be encouraging! Note: This is a personal account of the writer. We welcome more such stories on how a show, an incident or a situation on screen has effected your real life. We will be more than happy to publish it. 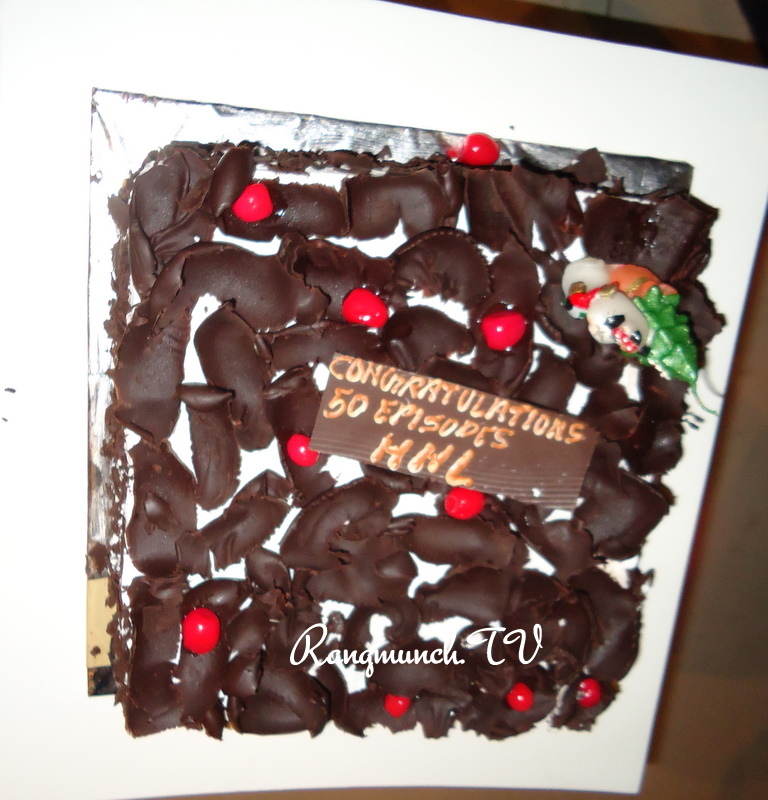 Watch the team cut the cake and celebrate the successful completion of 50 Episodes of Humse Hai Liife on Channel V.
Celebrating Every Milestone: Humse Hai Liife Scores a 50! “We are throwing a party for the kids, as we have completed 50 Episodes” is what Producer Nissar Parvez told us beamingly. The entire team of the Humse Hai Liife got together, to celebrate this first milestone of their show on Channel V.
With an assorted bunch of friends, cast and crew the Producers Gul Khan, Gorky and Nissar Parvez brought the celebration in with song, dance and ofcourse a yummy cake. It is only when one learns to celebrate appreciate and celebrate little joys of life does one live every moment of his or her existence. And the party last evening was just about that. 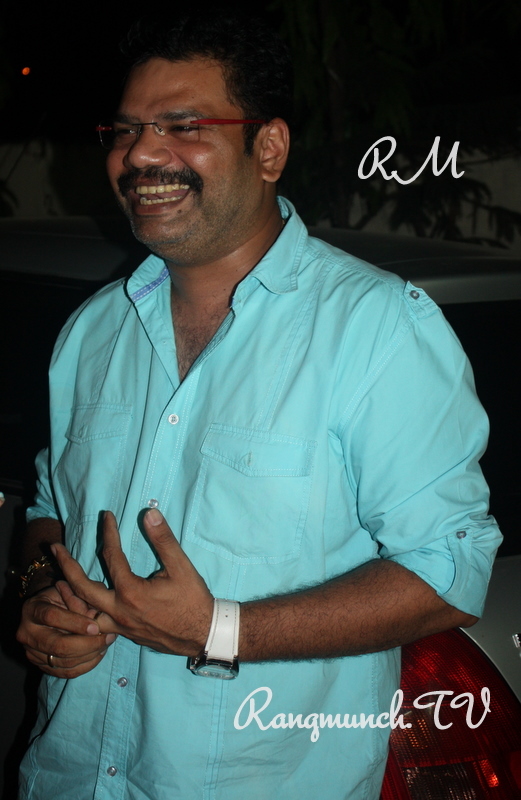 The actors despite having walked in after a hectic days shoot looked all set to dance all night long. We are leaving you behind with some pictures that speak for themselves. The bunch with the Creative Head Persis. 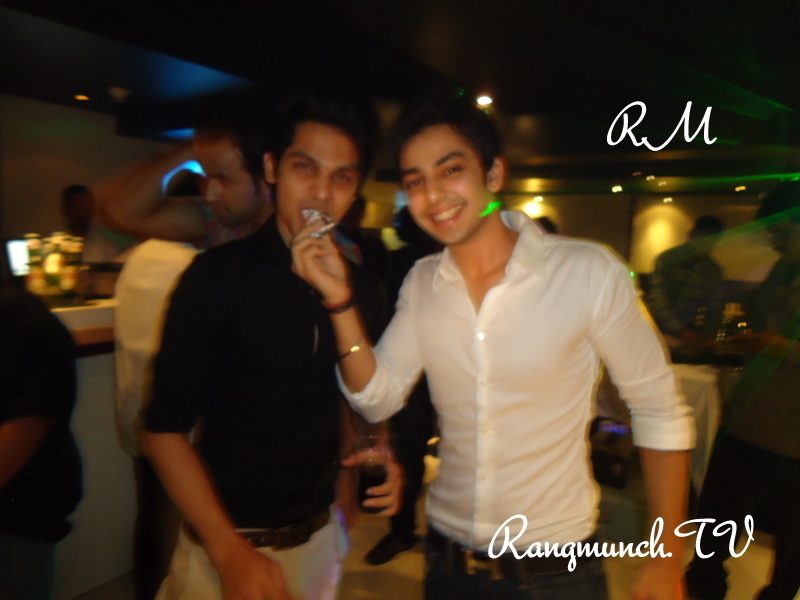 The Delhi Boys-Himansh and Yuvraj ! 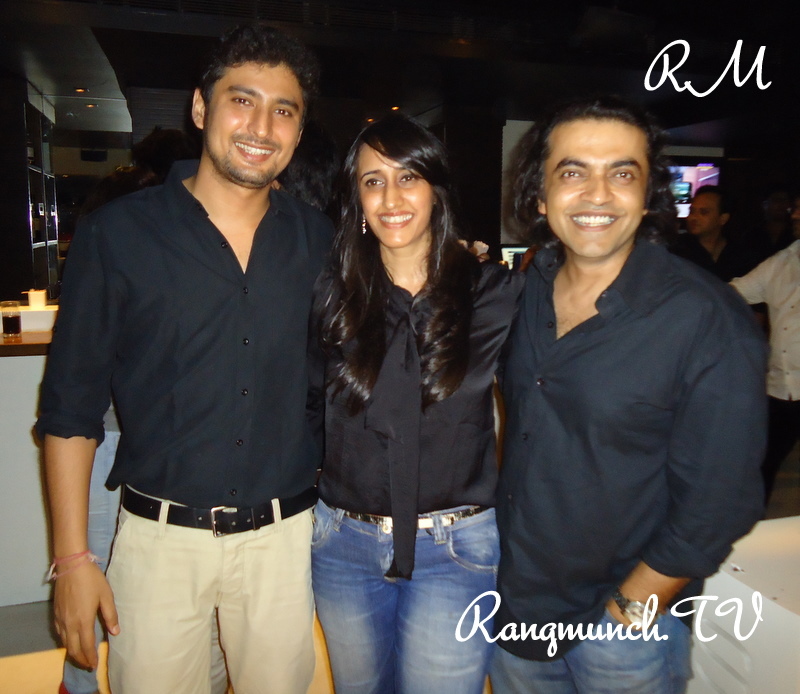 Himansh and Abigail with DOP Abhishek Gandhi and Swati Ghosh of Rangmunch. We hope the show touches many more milestones in the days to come and the entire gets more such occasions and reasons to celebrate! Fun, Fans and Friendships on the sets of Humse Hai Liife!! A youth show always brings a smile on your face for the vibrancy in spirit it carries. The visit to the sets of Channel V’s Humse Hai Liife was no different. As the euphoria of the date night has died down, the show is now moving towards a track with more fun filled moments with Raghav and Sia’s story taking a new direction. Raghav is still clueless why he was ditched despite planning such a wonderful evening and being a perfect date, and Sia finally learns of who the face behind the surprises actually was. Amidst all this, Rangmunch.TV caught up with the entire bunch, Raghav, Sia, Arjun and Saloni off screen and allowed the camera to record on as the bunch had their share of fun reading letters from some fans of a High School in, Kharagpur (West Bengal) and reacting to them! Himansh who plays Raghav was so overwhelmed by some of the contents of the letter, he had to be brought back into the interaction mode just so that we could your get your High School heart throb speak and respond! Unlike what the show portrays Sia and Saloni aka Abigail and Heli are thick friends in real life and love hanging out together all the time! Dont miss Yuvraj’s subtle yet rib tickling sense of humour! We say no more, as we pass the baton to you all to watch this little video clip fresh from the sets of Humse Hai Liife! Dont forget to leave your comments behind. I, Me, Myself: Abigail Jain! Abigail proudly tells you, her name means ‘Father’s Pride’ and so she is! 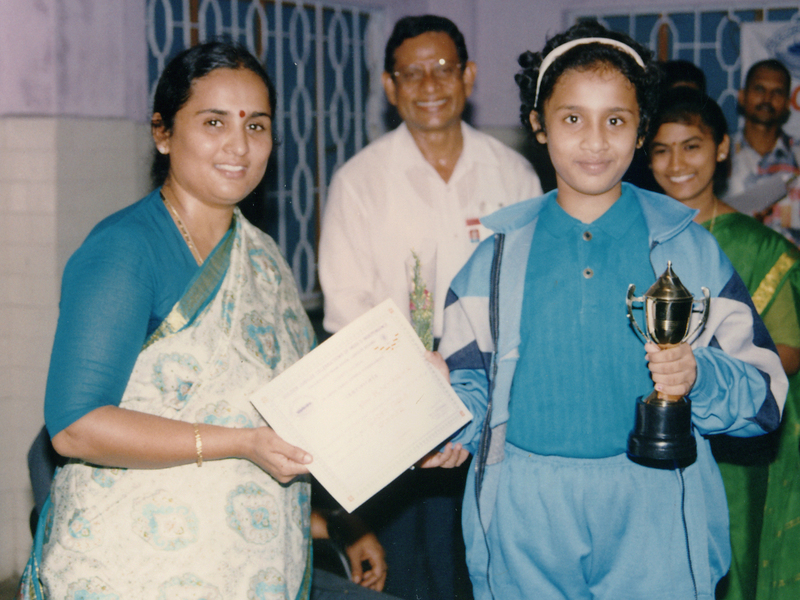 At 15, she set out to become an actor and has done a brilliant job of it so far. Today she plays the confident Sia Dhillon who carries the dream of wanting to become a boxer on Channel V’s Humse Hai Liife. In the show, everyone dreads her, boys and girls included, since they dont want to mess with her and get punched in the face. Abigail or ‘Aby’, as her Director Gorky fondly calls her, is not very different in real life. She has made a name for herself, has worked on her look in the show, learnt boxing, and now she also wants to eventually complete her studies! This is Abigail in a nutshell, but let us see what more this little wonder reveals about herself in our segment I, Me, Myself! Rangmunch: One thing that is missing in your life at the moment ? Abigail: Aah um!! I think it will be my studies. Infact I will be giving my 12th this year. Right now I have to focus on completing my education. I have to graduate. So I think ya, studies is what is missing at the moment. Rangmunch: Do you listen to others ? Abigail: Yes, I listen to everybody and I do what I feel is right in the end (laughs). Abigail: I think I could be a little more focused because I play around a lot. 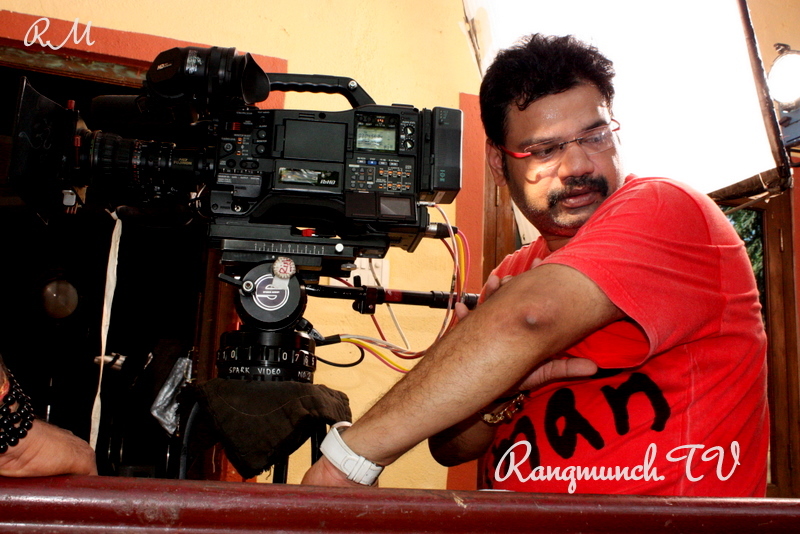 Even on sets I get distracted very easily and have lot of fun so I think I should focus a little more on my work. Rangmunch: Do you believe that first impression is the last impression? Abigail: No not at all. I never judge anybody by looking at them. I am not that person who says “issey acchi vibes nahi aati , ussey acchi vibes nahi aati.” I have always waited to know somebody because even the persons I have got the worst vibes from, are my very good friends today. So I don’t think first impression is always the last impression. Rangmunch: Do you take risk ? Abigail: Ya I do (says promptly), I love taking risks. I think it either makes you or breaks you. So it depends on you. But if I don’t take the risk, I know that I am going to go on and regret and be like “what if…” So I think its always better to just go ahead and do what you feel like and whatever the outcome is, it’s just destiny. Rangmunch: What is your biggest fear ? Abigail: (after a pause) I have always been afraid of not doing anything, of getting bored. Its always been like that. Even when I have an off I’m not the kind of person who will be like ok chalo ghar baith thi hoon, let’s relax and all. I always like to be on the move all the time, go here, go there and I hate the fact that I am sitting at home and doing nothing. So ya getting bored is what I fear the most. Rangmunch: What are you proud of? Abigail: Umm! Accha here I am stuck! (Smiles) I think I am proud about the fact that I started working at a young age. Many people tell me that you shouldn’t have started but I knew that if I wouldn’t have taken the risks at that point of time, I may not have got it in the future and then I would be regretting it. Many people still tell me to complete my education but I know what acting means to me and what all my shows have meant to me in the past. Every show that I have done good or bad has always taught me something or the other. So I really love my work and I am proud of the fact that I listened to my heart at that point of time and I still do it. Rangmunch: Who is your biggest critic ? Abigail: My dad. 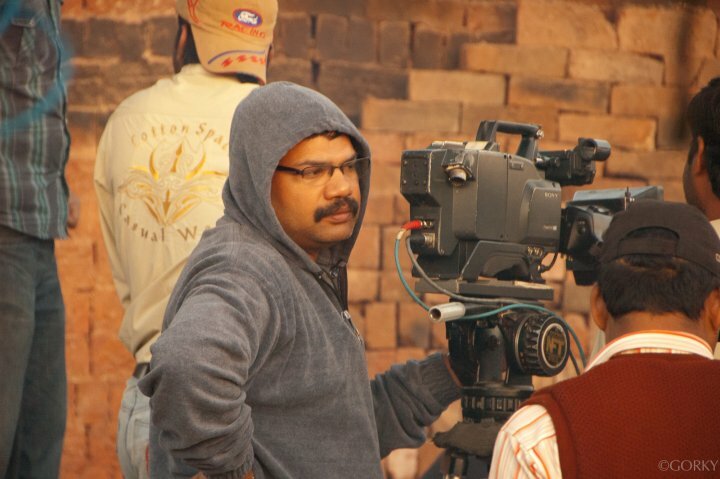 He is a director for serials, and I can’t even sit and watch an episode with him because I get so conscious. If he comes on the set I cant even perform in front of him without getting conscious. He is quite blunt and he will tell me what he feels like. Rangmunch: What is the craziest thing you want to do.? Abigail: Aah!! I don’t know if its crazy enough but ya its always been my dream that when I get a car , I am going to drive down to ladakh with few of my friends. I really want to go for this long road trip for a month or two when I have earned enough and saved enough. Rangmunch: Who has had the greatest impact on your life ? Abigail: It would be my mom. It really matters to me what she feels about me and if I hurt her in any way I really feel guilty about it. Most of the times you know things that she says they bother me so much. My mom has been an important part of my life throughout. She is my best friend. Abigail: No! I don’t sit around negative people. I really have this bad habit. Ya I’m friendly but if I think somebody is negative negative , I just get up and move out. I think life has negativity of its own , so I don’t think I have to sit and get more from people. Rangmunch: Do you take time out for yourself ? Abigail: Yes, I do. I love reading. I go very frequently to book stores and malls and pick up a book when work gets too much. I am a crazy Harry Potter fan. I like the chicken soup series too. I have read a lot of Daniel Steele in the past but not any more. Rangmunch: Do you stand up for yourself ? Abigail: Ya! I think its very important to stand up for yourself . If you don’t do it , no one will do it for you .If you know what you want , you should stand up for yourself. Its one of the most important thing about a person. 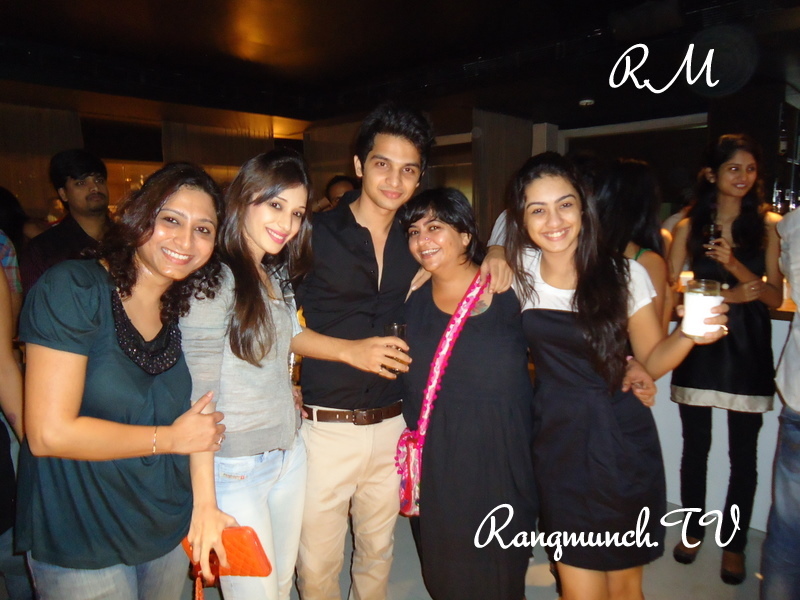 Rangmunch: Who’s that one person you want to meet once in your life time ? Abigail: Daniel Radcliff..Harry Potter…(laughs) As I said I am a huge Harry Potter fan. If someone asked me what my ambition was 5 years back, I would say to marry Daniel Radcliff. Rangmunch: Are you a pet lover ? Abigail: Yes, I have a dog. I have a miniature Pomeranian, and her name is Honey. Rangmunch: What has been the most embarrassing moment for you? Abigail: When I was in the 8th standard, my mom got me this wrap around skirt which just came out. It was this long flowy skirt. I was at a friend’s birthday party dancing and the skirt slipped down. From that day onwards to this date , I have never ever worn a skirt.I have worn shorts, even hot pants but NO skirts. It just reminds me off the that moment. Abigail: (Promptly responds) It would be my parents. I am really very lucky to have parents who have been so supportive and so encouraging. You know joining work at the of 15 was very difficult but the fact that they supported me and didn’t pressurized me and let me do what I wanted to do. I think whatever I am today is because of them, so I am really grateful for them. That’s Abigail for you, charming, simple and a girl next door. Hope you enjoyed this interview. More to come from this camp.